The Leica CET103 elevating tripod is constructed of medium weight aluminum for added durability when used with a variety of laser levels including the Leica Roteo models. Its height measures between 33 inches and 8 feet tall. It has an adjustable column with a 12-inch crank, which can be fine-tuned in millimeter increments for exact height adjustment, and the elevating column can be raised an additional 26 inches. 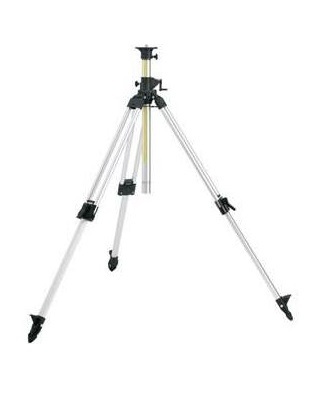 This aluminum tripod comes with a bubble level for precise leveling at all your project sites. The Leica CET features three quick release clamps, a 5/8-inch 11 tripod thread as well as black removable rubber feet to help keep the tripod in place indoors on slippery surfaces and pointed feet for uneven or outdoor surfaces. The unit weighs 8 pounds and 13 ounces and has a 90-day warranty.